The P&S Paint Coating Surface Prep helps you remove oils from the surface for easy coating application! Virtually every polish leaves behind some ultra-fine layer of oil that is almost impossible to see. The surface may also have dust particles, finger prints, polishing particles and other contaminants naturally found in the air settling on the vehicle. This contamination can cause a coating like the P&S Inspiration Ceramic Coating, to not bond properly to the paint. Take Surface Prep, spray it onto a panel, let dwell for 30 seconds and wipe away with a clean microfiber towel. 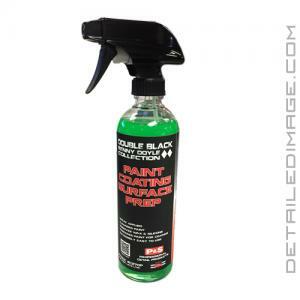 Apply to the entire vehicle and inspect the paint thoroughly before applying your first coating layer. When you need a product to pre the surface for coating application, the P&S Paint Coating Surface Prep is a fantastic choice! Paint Coating Surface Prep solution is used as a surface preparation solution to clean paint surfaces prior to application of automotive coatings. This product was specially formulated for use with Inspiration as part of the P and S Double Black Renny Doyle Collection. The purpose of this product is to cleanse the paint surface of wax, silicone or other contaminants that could potentially hinder the coatings performance. Once paint correction has been completed the paint surface must be properly cleaned prior applying Inspiration. Spray apply a heavy coating of solution saturating the paint surface. Allow product to sit for 30 seconds and wipe clean frequently rotating towel to ensure proper removal. repeat process over entire vehicle. Prior to applying coating, inspect paint thoroughly.